Why am I looking forward to this novel? It’s billed as being inspired by both Game of Thrones and Shakespeare’s King Lear. Enough said. 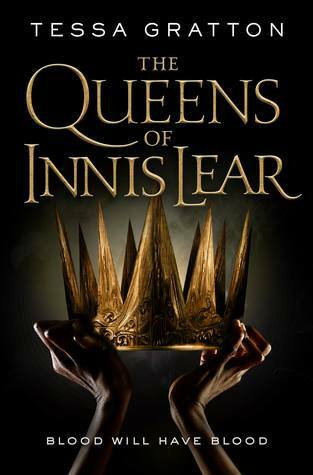 “Tessa Gratton’s debut epic adult fantasy, The Queens of Innis Lear, brings to life a world that hums with ancient magic, and characters as ruthless as the tides. I did read a book by this author. Great cover! I love the sound of this one and the cover is really eye catching too. OOoh nice! Haven’t read a book by her in a long time! Hope you enjoy this one! I am glad you are looking forward to this. I don’t know about calling it her “debut” though. It might be her first big girl novel, but “debut” has always struck me as the very first book published. Yes, this one sounds really good! Looks like the publisher calls it “debut epic adult fantasy”, so just her first adult epic fantasy. Definitely a little misleading though. Yeah, it bugs me that these days publishers throw the word “debut” around like candy. But if the new book is from a the genre very different from what the author is originally known for writing though, I’ll let it slide as long as the distinction is made. It actually annoys me more when established writers publish something new under a pseudonym, and publishers who know full well who they are don’t publicize it but continue to bill it as a debut. Orbit, I’m looking at you. Publishers. I love to hate on them. But then when I get in a situation without them [ie, indies] then I’m hating on their absence just as much. It will be interesting to see what this author does with the fantasy genre. Great choice! Doesn’t Tessa Gratton usually write crime fiction? Or maybe I’m thinking of someone else. In any case, I love the cover and it sounds REALLY good. I should google the author. I thought she wrote YA fiction, but it could be mystery and crime fiction for all I know 🙂 Her name sounds familiar but I don’t know anything about her work. I might need to track down a few Game of Thrones style books to expand my fantasy reading!